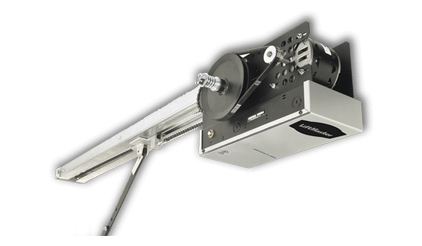 The MT Model is a medium-duty Logic trolley door opener, as manufactured by Chamberlain group. and is for use on standard lift sectional doors. It is rated for 12 cycles per hour during peak periods. Up to 50 cycles / day. Built‑in 3‑channel, 315 MHz radio receiver accepts up to 20 Chamberlain® Security+® or unlimited DIP switch remotes. 3‑button remotes can be programmed for open/close/stop operation. Integrated Timer‑to‑Close (TTC) allows programming from 5 to 60 seconds in 5‑second increments. 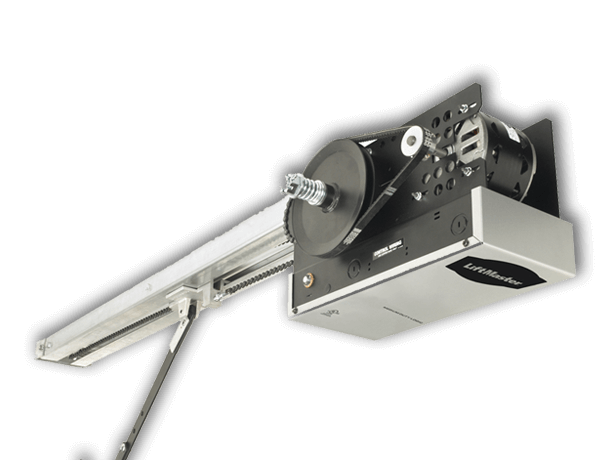 Allows for timed automatic door closure after the door reaches the full open position (Requires monitored safety devices, with CPS‑U, CPS‑UN4, or CPS‑EI). First‑stage heavy‑duty 4L V‑Belt; second and third stages #48 chain. Adjustable friction clutch helps protect against damage to the door and opener should the door meet an obstruction. Floor level disconnect provides emergency manual operation. High strength dual L‑rail track with exclusive nylon quiet gliding chain guides on rail spacers for quiet, smooth operation. 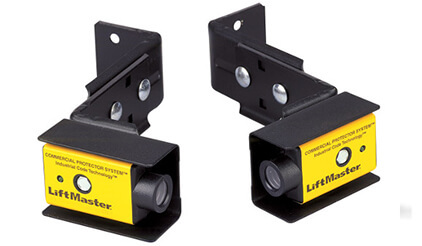 Includes quick‑mount header bracket which provides fast, swing‑up installation. The MT is equipped with a Security+ rolling code receiver. With every activation, Security+® transmits a brand-new code, one of over 100-billion codes, never to be repeated. The MT is equipped with a Security+ rolling code receiver. With every activation, Security+®transmits a brand-new code, one of over 100-billion codes, never to be repeated.